As your baby begins to grow, they will quickly need their toddler pillow that's big enough for their growing body. But which one to choose? Sleep is an essential part of a toddlers day as it’s when they'll be resting and the body will be growing and repairing throughout the night ensuring that they wake up the next day in a good mood. There's a whole range of toddler pillows available on the market, and this extensive choice makes it more difficult to make a final buying decision. So, to make it easier, we’ve created this full buying guide to help you find the best pillow for your toddler. 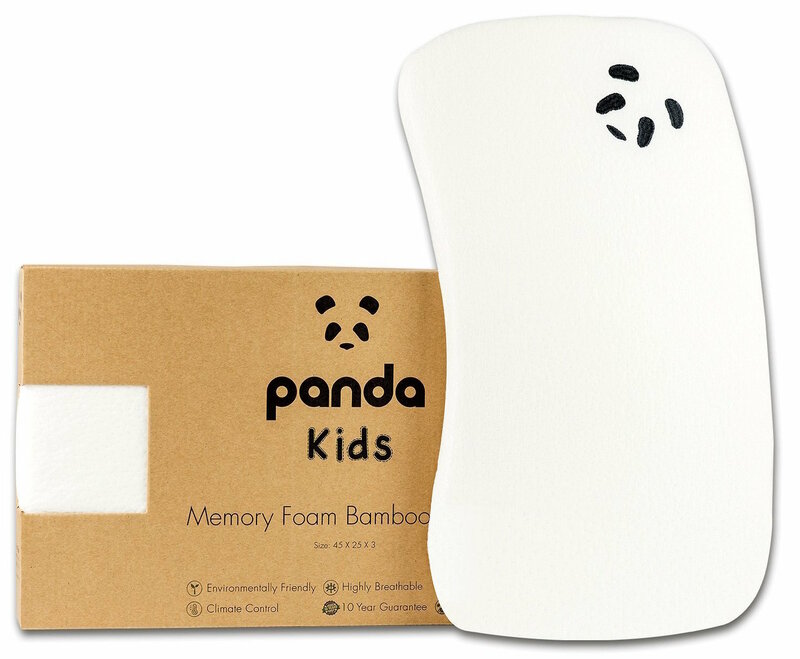 The original Panda Kids Memory Foam bamboo pillow gives excellent neck and head support to your young toddler while keeping their spine aligned throughout their sleep. The pillow has a deliberate contour curved design which works to reduce the chance of flat head syndrome by decreasing the level of pressure that's placed against the head. The bamboo material is both hypoallergenic and antibacterial, resisting fungi, mould, mildew and other dust germs. This helps to protect your toddler against any allergic reactions or skin irritation. So, this is suitable for your toddler even If they suffer from skin issues and Bamboo is naturally anti-static so doesn’t stick to the skin. The pillow is thermo-regulating and breathable keeping your toddler cool throughout the night without overheating. It adjusts to the seasons so will promote coolness through summer while retaining warmth in the winter months. The fabric has strong, absorbent properties to wick moisture and resist odour to ensure it stays dry and comfortable, while it is also easy to care for because Bamboo requires less frequent cleaning. By being produced to OEKO-TEX Standard 100, it has passed testing and certification to ensure that it is free of any harmful substances or chemicals. ClevaFoam has been developed and engineered especially for babies offering unrivalled support and comfort to young toddlers. 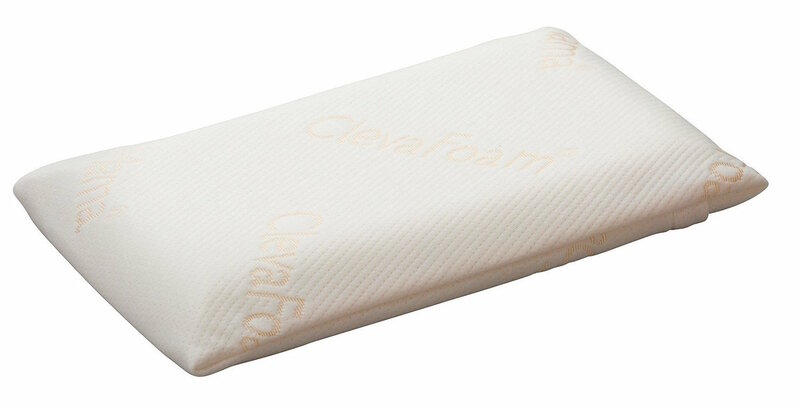 ClevaFoam shares similar properties to memory foam but has a more superior cell structure. Traditional memory foam has a closed cell structure which makes it dense and heavy leading to lower airflow which causes heat retention. ClevaFoam uses an open cell structure which makes the material lighter reducing heat retention as the air can flow through it with ease keeping your child cool throughout the night. The pillow is shaped in size perfect for a toddler and is excellent for a first pillow. It has been scientifically proven in studies to be the only pillow to reduce pressure on the back of babies head by 50%. The pillow is encased in a removable and washable cover. Replacement covers are also available so you can keep the pillow fresh and clean always. The Little Green Sheep pillow is a slightly more expensive alternative and is constructed using organic wool pillow which provides your toddler with an extremely comfortable sleep, keeping them supported throughout. The pillow will gently mould around the shape of your child’s head. The pillow is UK made from GOTS certified organic wool and is breathable, so air can flow freely through it regulating your toddlers' temperature as they sleep. This increases the length of time they remain in a deep sleep meaning they will wake up more rested and fresh. The organic wool is hypo-allergenic, and anti-dust mite and the wool helps to reduce the symptoms of any allergies that your toddler suffers from. The material is naturally fire retardant and is free from any harmful chemicals or substances. The Pillow is slightly more expensive than its competitors; however, this is because it’s made from premium materials and is built to last. Because it’s an organic pillow, there is no cover included, but it’s great for the eco-conscious parents. Homescapes have created an affordable yet effective toddler pillow which is 100% natural and is constructed using high quality and healthy fabric. The pillow is manufactured using 100% cotton with a 260 thread count while also having anti dust mite protection. The filling is a mixture of Down and Goose feather which provides a soft touch for your toddler's face but also provides support to the neck and head area. Overall the firmness rating is medium firm. 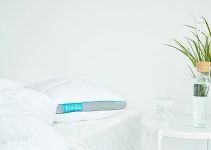 The pillow promotes temperature regulation all year round throughout the seasons, plus the pillow comes in a removable and washable cover. 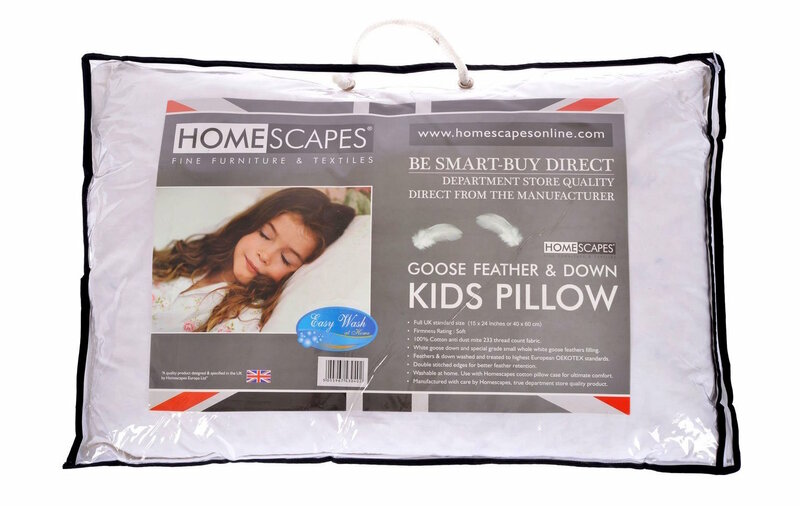 It’s becoming increasingly difficult to find feather toddler pillows with the increase in memory foam alternatives, but Homescapes have created a pillow that performs exceptionally well. The pillow also has strong feather retention so it’s unlikely that your toddler will be able to squeeze them out like would be the case with cheaper feather alternatives. The soft medium firmness makes it an excellent entry for toddlers who have yet to experience sleeping on a pillow. 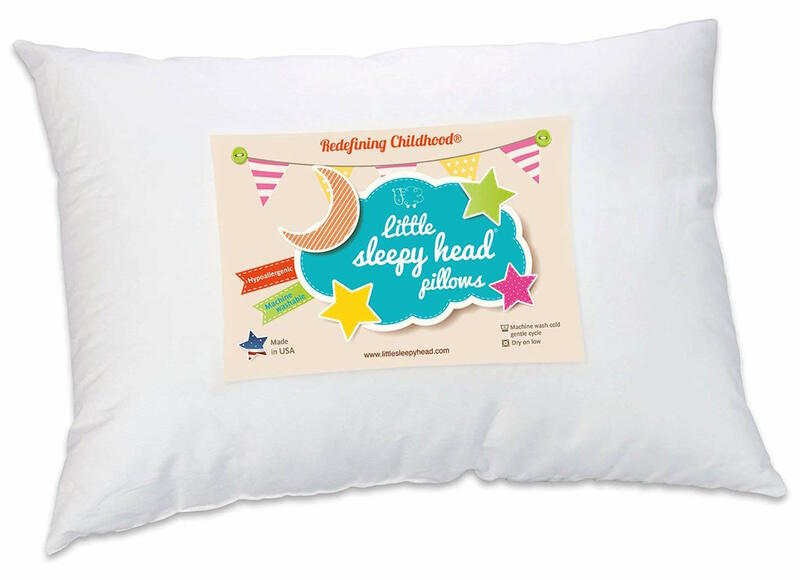 This Little Sleepy Head pillow is perfectly sized for your toddler and can be taken anywhere and not just limited to the bed. The pillow is made in the USA using premium materials by a family run company and has the softness to make your child drop off to sleep quickly while retaining its shape over time. 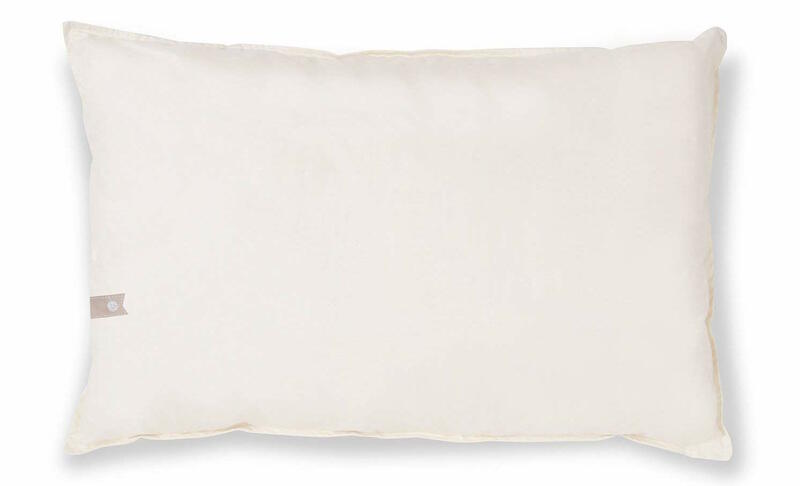 The pillow is also machine washable and 100% hypoallergenic. We recommend that you still buy a pillow that’s hypoallergenic even if your toddler has no allergies because there’s no reason to take the risk and you don’t want them to start developing them if they’re constantly exposed to them. The filling is made using premium polyester cluster fibre which has a cover made from 100% cotton and 200 thread count fabric. It means that it's snug yet provides support to your toddler’s neck. Over time the pillow conforms to the shape of the user, so the more your toddler uses it, the more it will fit their unique needs making them fall to sleep faster and faster each time. Included with the pillow is a 90 day no questions asked money back guarantee so if for any reason you’re not happy with the product you can get a refund. This is how sure they are that your toddler will love the product. A toddler pillow will be the first real pillow that your child is bought to sleep on every night and will mark the beginning of the transition from cot to an actual bed, so it’s a big step on the road to sleeping independently. They differ to traditional adult pillows because traditional pillows are larger which can cause neck problems and not provide adequate support. They are also not as soft or sensitive so can irritate a child’s skin. The best toddler pillows are small in size which increases the comfort levels to provide a good nights sleep. By buying the most suitable toddlers pillow, this will get your child into a consistent sleeping routine and lifestyle to help them get to sleep easily each night without disturbance. It’s essential that if you have a toddler that you don’t upgrade them straight away to an adult pillow. A regular pillow is constructed in size to provide support and comfort for an adult-sized body. A toddler is smaller in size so they will find it hard to rest their head on an adult pillow which can cause strains in their neck and shoulders. These strains won’t have a huge impact straight away, but over time this can lead to some long-term issues and sleepless nights. Toddler pillows are designed perfectly for the size of their proportions which means they can sleep in comfort and have a restful sleep. What age should your child start using a toddler pillow? The age that you should introduce a toddler pillow to your child's life is a hotly debated topic amongst parents, and there is no one size fits all answer. However, it's universally agreed that the best time to give your child a toddler pillow is when they make a move from cot to bed. This usually happens around the age of 18-24 months. However, it's not uncommon for parents to introduce a toddler pillow while their child is still sleeping in a cot and they experience no issues. The beautiful thing about the human body is that everyone develops at different rates so different children will be ready at different times. There are some signs that your child may be ready to move up to a toddler pillow such as if they begin to find it hard to sleep without having their head propped up. The whole point of a toddler pillow is to make them more comfortable, so if they’re sleeping perfectly fine without one then there is no rush to introduce one, but stay aware of the hints that show they’re ready. ​If your child has sensitive skin, then it's essential that you purchase a hypoallergenic toddler pillow which uses premium materials that reduces any potential irritation or infections. The material also protects against dust, germs and other microbes that can cause an allergic reaction. When you’ve found your desired toddler pillow, don’t just take the manufacturers word for it that it's 100% hypoallergenic, so you should always look for their supporting authentic safety certificates. This ensures that your child will be as safe as possible because they'll be spending a large part of their life face to face with this pillow. By being aware of the allergies that your child suffers from this also makes it easier to make a buying decision. For instance, if your child suffers allergic reactions to Goose feather, then this will narrow down your shortlist. Toddlers are the best at making a mess out of nothing, so it’s essential that you double check how easy it is to clean your pillow of choice. This is because you must wash it regularly to remove the saliva, general dirt and grime that will accumulate on the pillow each night. You need to ensure that the pillow has a removable case that can be machine washed and that the actual pillow itself can be machine washed. There’s nothing worse than putting a non-machine washable pillow in the washing machine, and it comes out misshaped. You’ll need to make a compromise between soft and firm, and they both have their positives and negatives. There’s a simple test that you can do to test the firmness of a pillow. If you apply pressure onto the pillow and it doesn’t change shape, then the pillow may be too firm and can be uncomfortable for your toddler. If you apply pressure and the pillow doesn’t regain its shape, then the pillow is too soft and could be a breathing hazard as your toddler could sink into the pillow and suffocate. Ideally, you want a pillow that has the firmness to bounce back into shape and provide support but also has the softness to give comfort to your toddler’s body. Latex is similar to memory foam except it has greater airflow which regulates the user's body temperature more effectively. Latex pillows provide strong support to the neck and head with its cushioning effect. Also, it's hypoallergenic which makes it ideal if your child has asthma. Polyester is a human-made fibre but can also be made using wool which gives it a soft and gentle feel while also bringing support. Polyester pillows are usually more affordable because they use cheaper materials which also means that they typically lose their shape and support within just a few short months, so you’ll find that you'll end up replacing this type of pillow regularly. Memory foam changes shape based on the shape of your baby’s neck and head to provide even and consistent support while relieving stress from pressure points. It’s important to get a memory foam pillow that’s not too firm; otherwise, your toddler may find it hard to move. Memory foam usually leaves you feeling refreshed and energised in the morning due to promoting a night of more restful and uninterrupted sleep. Feather and Down pillows are more affordable alternatives and provide good neck and head support. Down gives a soft feel so the higher the proportion of Down the softer the pillow will be. Feathers counter this by bringing a firmness, so a Down & Feather blend works well. The majority of toddler pillows are accompanied with a satisfaction guarantee, and these can range from 30 days up to multiple years. This can cover anything from wear and tear to loss of shape but will vary from manufacturer to manufacturer. A longer-term guarantee will give you the peace of mind that a company believes in the quality of their product, so it’s likely to last longer. The pillows with more extended guarantees will often cost more, but you’ll save more in the long run because they are higher quality so they’ll have to be replaced less often, so it’s a longer-term investment. Will My Child Reject the Pillow? Sounds weird, right? But this has been reported by doctors that it’s common for toddlers to reject the first pillow there given. It's usually because they’re so used to sleeping without a pillow and this is strange to them. This isn’t anything to worry about, but it can be concerning for toddlers; however, they usually get over this. If they kick up a fuss at first, don’t force it onto them but it may take a few days or weeks for them to get used to it. Eventually, all toddlers will need to use a pillow, so it's only a matter of time but don’t force them.